Melville decorated bowl - 10" (254 mm) diameter. David Melville graduated from Medway College of Art and Design in Kent with a distinction in 1979. His workshop is in Frindsbury, near Rochester. His aim is simple - to make useful and appealing pottery. He makes pots in earthenware and stoneware. His stoneware domestic range has retained continuity since he started making it in 1979, so his customers can be sure of getting replacements and additions to their collection. He has a large range of planters and pots for outdoor use made from terracotta which is high-fired to withstand extremes of climate. David uses a variety of techniques for his one-off decorative pieces - thrown, altered and hand-built. 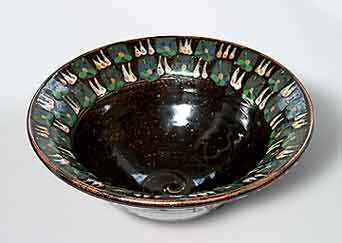 The glazes are made to his own recipes and where possible he likes to use local materials. His spare time is taken up in working in further education, lecturing at clubs and acting as a consultant in ceramics for educational establishments.